Hello! We are Melinda & Keith! We’re thrilled and grateful that you are interested in learning more about us. We respect your bravery and selfless decision to consider adoption and hope this letter gives you a glimpse into our lives and the kind of love, care, and security we will give your child. We initially met online over thirteen years ago, being drawn together by similar core values and strong connections to our families and friends. Since then, we’ve enjoyed a loving, stable marriage based on respect, honesty, and trust. After many years of infertility, we embraced adoption as a way to make our dreams of raising a family come true. We adopted our son, Declan, over five years ago, and there is no other road we would have wanted to travel than that of adoption. We have enjoyed every minute of parenting, and look forward to welcoming another baby into our family through adoption. We are a happy and active family who will adore, protect, and celebrate your baby if chosen. Your baby will be given every opportunity for a wonderful life surrounded by family and friends with unconditional love to share! Melinda is my angel! She is kind, loyal, and genuine. Melinda was raised in a large and supportive family. It was evident from the moment we met that she puts family first. Melinda inspires me with her faith. We attend church as a family and agree children need a moral and ethical education as well as an academic one. Melinda ensures we pray every night with Declan because she understands that praying together teaches children to pray on their own. 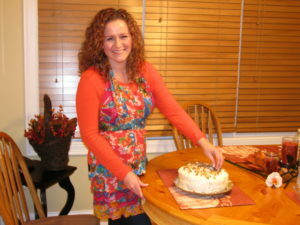 Melinda loves to bake and cook, making delicious meals and desserts, like her mouthwatering carrot cake. Declan gets excited to help her in the kitchen, whether it’s mixing the ingredients or tasting the result! She also enjoys crafty projects, like stitching a stocking or creating unique costumes for Halloween. Melinda loves music, and I often catch her dancing with Declan in the kitchen. She also likes to read — especially to Declan at bedtime. Whether it’s Dr. Seuss or Corduroy, Melinda knows the exact voice to use to make Declan laugh and keep him engaged. Melinda is the mom every kid deserves! She’s loving and nurturing, fixes “boo-boos”, and kisses away tears. Melinda is ready to share her big heart with another little boy or girl. She plans to take several months off from work to bond with your baby and become a stay-at-home mom soon. Keith is a man of uncompromising integrity and the most honest man I’ve ever met! He lives life to the fullest and is committed to me, our marriage, and Declan. His insight and attentiveness make him an amazing dad. He’s an incredible handyman too and can fix anything! Keith enjoys gardening and has surrounded our house with flowers. His garden overflows with vegetables and herbs. He shares this joy with Declan, showing him how to plant seeds that can grow into giant pumpkins. Keith’s a grill master, specializing in the most savory baby back ribs I’ve ever tasted! On weekends, he has so much fun making breakfast for Declan, whether it’s scrambling fresh eggs from our chickens or shaping pancakes into cars. Keith is an avid baseball fan. He’s already taught Declan how to throw a fastball. Keith also enjoys daddy/son fishing outings. When it rains, music and laughter can be heard throughout the house, as Keith and Declan play “marching band” complete with parade hats and musical instruments. Keith’s career, as a computer programmer, brings him joy but not nearly as much happiness as being a dad. He’s told me, that before Declan was born, he truly had no idea it was possible to love someone this much. Keith is a wonderful father, and he can’t wait to build a bond with another child. When Declan was born, over five years ago, our family grew and our hearts expanded in ways we cannot describe! Declan is loving and playful. He regularly surprises us with new words he’s learned and amuses us with his expressions and antics. 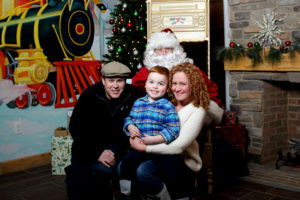 Declan enjoys playing with his trains, planes, dinosaurs, and various musical instruments. He has a sweet and gentle heart. Declan loves babies and kids of all ages. He can’t wait to be a big brother! We look forward to seeing Declan and his brother or sister collaborating and co-conspiring their way through childhood while building a lifetime bond. Family is everything to us! We spend lots of time with our large extended family, including summers, vacations and holidays. Thanksgiving, Christmas, Easter, and birthdays are filled with food, fun, laughter, and love. We support each other through thick and thin, are comfortable being ourselves when we are together, and accept each other for who we are. We enjoy spending quality time together, to create family memories, and to have moments that we can look back on with shared fondness. Your child will be embraced by two sets of grandparents, many aunts, uncles, and cousins. We also have a large circle of close friends who are like family to us, and they can’t wait to welcome your child into their lives. We have a spacious home filled with warmth and love. We converted our formal living room into a playroom for Declan, which is much more functional and fun! We have a large fenced-in yard with a swing set and plenty of toys for outdoor adventure. 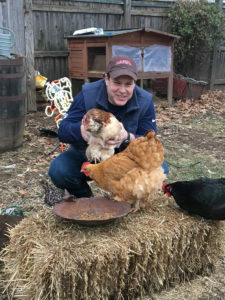 Our home is filled with animals as well, including our friendly chocolate lab, Stella, two bunnies, Elsa and Sven, and fifteen chickens! We believe it’s important for kids to grow up with pets. Declan has created a special bond with Stella; the two of them chase each other around the backyard. When the day winds down, you can find them snuggled up watching movies together on the couch. We live in a suburb outside of Boston, full of young families. Declan’s best friend lives right next door; you can often find them yelling over the fence to get each other’s attention. Our neighborhood is residential and safe, away from the craziness of the city, but close enough when we want to go to a Red Sox game, the aquarium, or the zoo. Our town has a small-town feel complete with a farmer’s market, concerts, and fairs in the park. Down the street, Declan and other neighborhood children get together to sled down a huge hill after a snowstorm or to visit the local library for story time and Lego night. During the holidays we decorate our home, inside and out, with pumpkins and scarecrows for Halloween, and trees, lights, and Santa for Christmas. We enjoy making the holidays special with traditions like carving pumpkins, filling stockings, and dying Easter eggs. We love spending time outside playing tee-ball, gardening, playing fetch with Stella, or picking fruit at a local farm. When we’re inside, you’ll find us listening to music, dancing, reading books, or watching movies together. In summer, we spend weekends at our lake house; Melinda’s parents and sisters live right next door. While there, we enjoy boating, jet skiing, swimming, fishing, or relaxing on the patio. Declan loves playing at the lake, especially with his extended family nearby every weekend; we are excited to watch Declan share lake trip memories with a brother or sister. In fall and winter, we head to the mountains to hike or ski. The mountains of New England, in autumn, offer a breathtaking color display, from deep reds, fiery oranges, to brilliant yellows. In winter, there’s nothing like sledding, building snowmen, or making snow angels followed by a warm cup of hot cocoa! After fun-filled days in the snow, we usually snuggle up on the couch with a Disney movie or play games like Operation or Connect 4. We can’t wait to adopt again and share our love and happiness with another child. Hopefully, you feel our sincere desire to open our hearts and welcome your child into our family. We believe children should be raised with love, understanding, guidance, positive role models, plenty of patience, and a good dose of humor. We plan to teach the wonders of learning, the value of family, the importance of kindness and respect. We will encourage your child, support them when they struggle, applaud them when they do well, and guide them when they make mistakes. We’ll help them develop confidence, individuality, compassion, but most of all we’ll shower them with love! Your child will always know your decision was made out of love, and your hope for giving him or her a fulfilling life with a family hand-picked just for them. We will ensure your child grows to understand and respect your courage and selflessness. We want you to know how well your child is doing throughout the years, and we are committed to sharing pictures and updating you on their growth and progress. We’re grateful for your time and hope you’ll consider us. We’d love to explore this relationship further. If you would like to learn more about us or arrange a phone call so we can get to know each other better, please call A Loving Alternative anytime at 1-800-556-5635. Please know our prayers are with you during this time. We wish you peace and confidence in the choice you’re making for your child. Check out the large mouth bass we caught when fishing! We dressed up as pirates for Halloween - Declan loved the pirate ship Melinda made! Carving pumpkins together for Halloween. 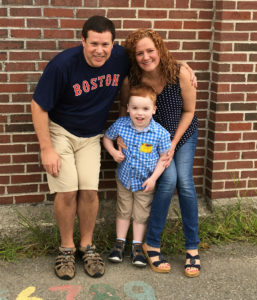 Adopting Declan made our dreams of raising our family come true. Declan playing on swing set in backyard. Declan practicing playing the piano. Holidays are filled with love, laughter, and lots of family. It's fun decorating our Christmas tree. Keith enjoying teaching Declan how to swim. Keith teaching Declan how to plant seeds for our garden. Melinda and Declan trunk or treating in town center. Melinda stitching a Christmas stocking for Declan. Picking apples at the local farm. Playing a game of Operation with Grandma. Taking a spin on the jet ski. Visits to Fenway Park are always fun - especially when you can pretend to be a catcher!. Melinda and Declan won the go cart race. Sledding down a huge hill a block away from our home.